Sales enablement can be defined as delivering tools into your salespeople's hands to help them be successful in the field. Marketing and sales teams have the same goals, to create revenue for the company, but the processes to achieve that goal are rarely optimized for success. Marketing thinks they are supplying the right content and assets for sales team use, but the sales team is unaware of the materials available or finds them lacking their specific needs — so they end up "going rogue" and making their own. Marketing and sales content won't be used if it can't be found. One of the top sales team complaints is marketing materials being housed within 5+ different repositories which are hard to navigate, search and find the items they need. 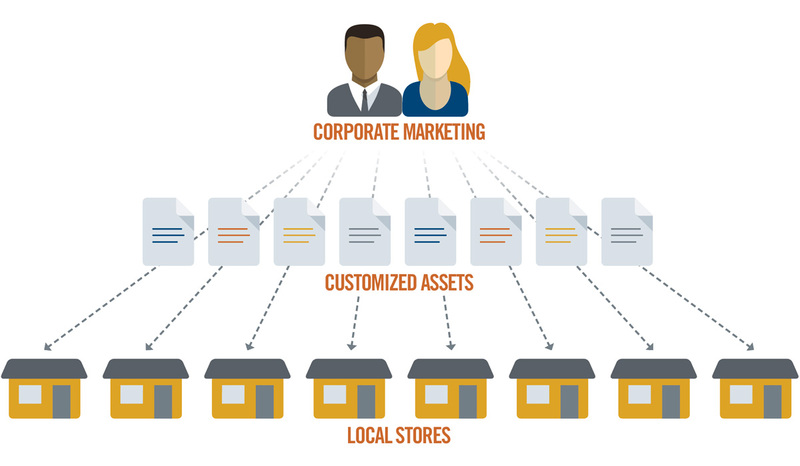 Try to consolidate your marketing resources into a single portal. If that's not achievable, at least set up interfaces, single-sign on, or hyperlinks between them. The portal should be user-friendly enough that not much training is needed. Simple search and download procedures should be intuitive and able to be completed quickly. Salespeople tend to live in Microsoft Word, PowerPoint and Paint, which means the collateral they end up sending out may not reflect the high quality of your brand. By housing collateral in a central location and limiting the options for printing and download, you can ensure the materials that get into the hands of customers and prospects are up to the proper caliber. Rogue content created by sales team members is often not in line with your brand style guide. I've seen pieces sent out with outdated logos, blurry logos meant for web-only used on printed products, off-brand colors, and just bad design choices in general. When you use a system that allows salespeople to customize their own materials using marketing-approved templates, the brand elements that are important (color, logo, fonts, etc.) are locked in so you can be sure the end product will represent the company correctly. If you're part of a rapidly-growing company, you need systems and processes that can scale. Reliance on a small graphic design team means you need to remove repetitive tasks like creating business cards for every member of the team or swapping out different locations on sell sheets. A self-service software takes the grunt work out of the hands of corporate design teams so they can focus on new projects and exercise their creativity. Buyers respond at higher rates to marketing that is personalized to them. Sales people know this, which is why they often pull together different parts of marketing pieces to create a custom piece of collateral. To address this, make your marketing flexible within certain limits. Giving your remote team the opportunity to localize the imagery or message for their audience means you have less requests coming back from the field for these kind of redundant requests that take up a lot of time. You know the old saying from John Wanamaker: "Half the money I spend on advertising is wasted; the trouble is, I don’t know which half." The same goes for your sales enablement content — most of it goes unused, which means you wasted valuable time, money and resources on creating it. With a proper system in place to distribute marketing materials you can track how often individual items are being used by their intended audience. After an annual collateral audit, things that haven't been used can be removed from inventory and retired. For industries that are under a lot of legal requirements for advertising like insurance, banking, or pharma, forgetting to include the legal disclaimer or having a salesperson publish illegal offers can lead to serious ramifications. A marketing portal that locks these required elements down for all collateral usage is one more safeguard against what could be costly mistakes. The S4 Marketing Resource Center meets all these requirements. To see if it is a good fit for your team, request a demo today. Karen aspired to be a cowgirl or a farmer, but after graduating from UW Madison she found herself crafting prose for luxury brands at an advertising agency. There, she developed a passion for working with graphic designers and marketing professionals, creating brand-right marketing across their networks. As a former client of Suttle-Straus, Karen joined the team in 2008 serving in marketing and sales. She considers herself an accidental salesperson, on a mission to increase her clients’ traffic and sales. At home, Karen can be found challenging her husband and three children to a downhill ski or swim race, growing organic produce while fending off garter snakes, or herding her small flock of chickens.